There is this thing called Godwin’s Law. The law states that the longer an online discussion continues, the more likely it is that someone will use Hitler or the Nazis in a comparison to prove their point in an argument. The law states further that by using Hitler or the Nazi’s in your argument, you then lose the argument by default. In my case the other day, the subject of our online discussion WAS Hitler. No need to make comparisons to prove a point. The comparisons to our world today were undeniable. I have been blessed this year to teach 17 students from around the world in an online course called Genocide and Human Rights. Every other week I meet with my Global Online Academy students to have a synchronous discussion via Skype about the topics we are studying. Yesterday our topic was the National Socialist Party’s 25 Points (their political platform), what kind of anti-Semitism was present in their own countries prior to 1938, and whom do politicians and media use as our scapegoats today. My students all signed on in their various time zones for the discussion. The girl from Jakarta was getting ready to go to bed. I had just finished my school day in Frankfurt. The Mexican girl in Monterrey and the Connecticut boy near Hartford were Skyping from school. And the girls from Oakland and Vancouver, BC had just woken up. It was an excellent concoction of culture to have for this discussion. As we worked through the 25 Points we discussed what the Nazi’s defined as a citizen. They believed that only true Germans should have the rights to an education, jobs, and health care. They believed that only Germans had the right to be a part of the political process. It is also clear that the National Socialists were looking for ways to get rid of the non-citizens and to keep Germany’s doors closed to immigrants. 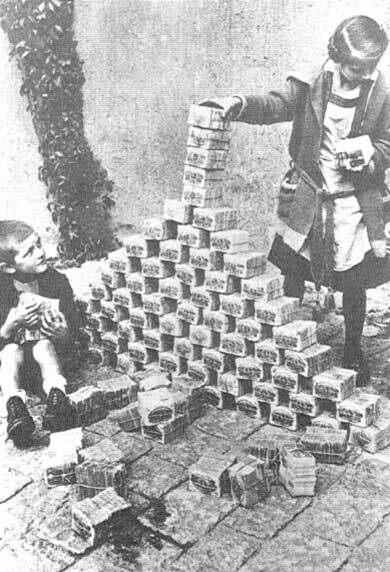 Children playing in the street with worthless Deutschmarks in 1923. The history student will understand this. During this time period in Germany, the people in the Weimar Republic were experiencing starvation, sky rocketing inflation, and unemployment. 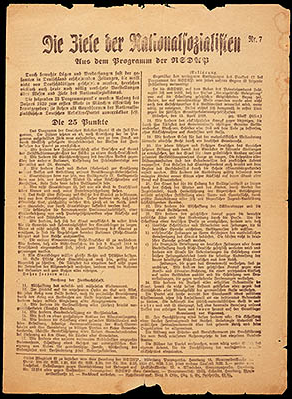 Politicians in Germany were looking for ways to provide for their people and to recover from the losses created by World War I. When countries are dealing with economic downturn, they usually become isolationist in response to the crisis. The word Jew is only mentioned one time in the 25 Points. But with a deeper reading it is easy to see that many of the points are targeted at restricting the ability of a Jewish person to have a decent living. It was also easy for the students to jump off from there and compare the 25 Points to the current rhetoric pouring from the mouths of those running for President in the United States. Health Care should only be provided to our citizens! We need to protect our jobs from THOSE people! We need to build a wall to keep illegals from getting in! We need to ship those refugees home! Many of the students were also surprised by what they found out about anti-Semitism in their home countries prior to 1938. They discovered that both the US and Canada had limited the immigration of Jews through legislation. They also discovered the incredibly sad story about the steamship St. Louis. Carrying 907 Jewish refugees, it was turned away from Cuba and other Latin American countries, as well as from the US and Canada. It is estimated that 25% of the passengers later died in Concentration Camps. Mexico on the other hand, in spite of their regulations on Jewish immigration, looked the other way to accept some Jewish refugees. 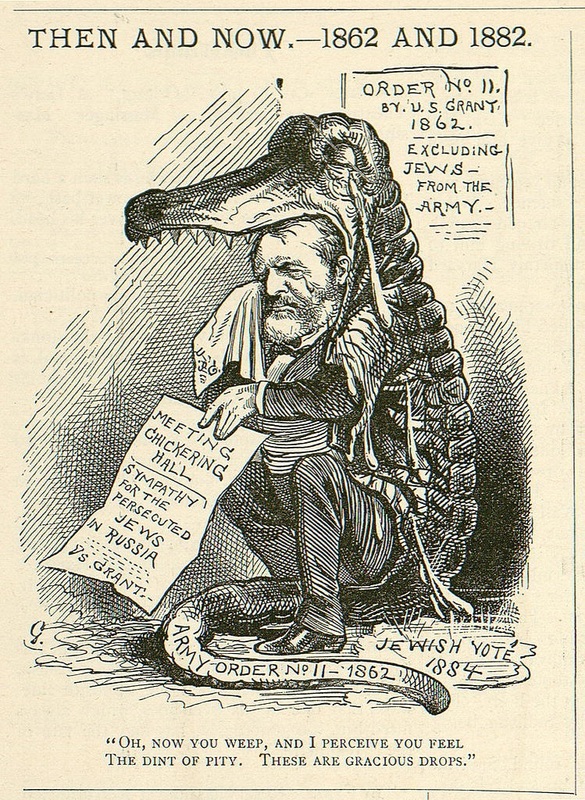 The Americans also discovered that Ulysses S. Grant tried to expel Jews from areas in the South during the Civil War. They saw that some of our well known American heroes like Walt Disney, Charles Lindbergh, Henry Ford, were known for having anti-Semitic views. The boy from Connecticut also shared his own personal story of harassment that he has felt for being Jewish. We then moved to the final topic. In our countries today, who are the scapegoats? Things got a little sticky here. The students had to get real about how they and those in their country sometimes perceive groups within their borders. We discovered in Mexico, they blame the government. In Indonesia, they blame the small Chinese national minority who control a large percentage of Indonesia’s wealth. In the US, it depended on the local community. Scapegoats in Oakland, CA were different from scapegoats in Hartford, CT. Most of the time, scapegoats in America are minorities: African Americans, Latinos, Muslims. The most difficult point of the conversation was when the Jordanian national living in Vancouver discussed the scapegoats of her home country. She explained how the Palestinian-Israeli conflict is blamed for a multitude of issues. As she spoke, I wondered what the Jewish boy from Connecticut was thinking about her comments. There was no hate or anger in our discussion. Everyone shared their mutual frustration with how their communities target groups to blame for the ills in society. And in our 40 minute discussion we did our part to open the doors of the world a little wider. We did our part to respect the differences in our group yet agree to shine the light on intolerance wherever we might find it. If you are going to live here, speak the language of here. Get a job. But we won’t give you a job unless you are from here. To protect ourselves and our economy, we are going to send you back to where you came from. Only true citizens of our community can capitalize on the social safety nets we have created. We can no longer live in a world dominated by isolationist thinking. We are citizens of the World. We need to open our hearts, point out the injustices we see around us, and pledge our allegiance to Humankind rather than just pledging our allegiance to our nation. Wow what a great lesson. So relevant. Oh, I am a big fan of “if you life here, learn the language, as fast as possible”, for good reason, because the lack of language skills is a big problem when it comes to integration. Otherwise though I agree. I think this particular part of history, especially the story with the St Louis is one of the reasons why Germany has decide to keep the border open, even though the current situation does put a strain on society. (The other is that at least a lot of the older generation knows very well how it is to be a refugee). I get it. If you are going to live a full life in the society you need to be able to speak the language and advocate for yourself. But I also know how difficult that can be. Living and working in an English speaking environment makes it difficult for me to learn and keep hold of my German vocabulary. Luckily the cousins forgive me for this. They speak to me in German, I reply in English. We both understand a lot more than we can speak. Last night we were watching Logo on KIKA. My daughter said something like “When are those people going to stop coming?” She just finished a unit on children’s rights and she was quite outspoken on why we need to host the refugees. But then I think seeing the huge numbers of people trying to cross the border scared her. I think for most of us it is difficult to get the concept. These people need to run for their lives or die. Who is responsible for sheltering them? Humankind. I have no answers, no solutions. Only to keep my mind open. And I hope we see a solution that allows the Syrians to return to their homes to rebuild their communities in safety. I think we all are afraid. But it’s not the first time Germany housed a number of refugees either. And I guess now that the Winter is coming, there should be a pause which is long enough to get a grip on the situation. You should watch German TV. That’s how I manage to keep my English going, by watching a lot of TV shows in English, and listening to English while falling asleep. Nicely done, Kathleen, Nicely done. You are my hero and you are so, so lucky to be doing what you love, the way you love to do it. As for me, I love parts of what I do, but there are times when . . . You know. You think I like grading all those papers? 😉 Thanks Tammy. You are amazing and your work is so vital to your community.